You peruse your local auto parts store and see all the beautiful tow straps with hooks. "That's what I need," you think, "I'll be the coolest guy on the block and Kayley will finally go out with me." NO. You are wrong. Here's why. For some crazy reason we can't figure out, tow straps are still sold with hooks. It's mind-boggling. You may have the occasional job that requires you to use a strap hooked to your 4x4. You go down to the nearest store and see a tow strap with hooks that you think is perfect. In reality, tow straps with hooks are probably one of the most dangerous pieces of gear you can own. It all relates to how these straps are made, how they are used, and how we all think about straps. First, you've been lied to. Most of the straps that you see for sale will say "recovery strap" but a true recovery strap has specific characteristics that make it ideally suited for recovery stuck vehicles. The main, and most important difference, is that recovery straps are made out of nylon. But we're getting ahead of ourselves. You need to know what a tow strap is for. A tow strap is for moving a disabled vehicle, that can freely move, from one location to another location. That’s it. A tow strap is not for moving a stuck vehicle. It is not supposed to see any jerking forces, only a consistent application of force. When you tow a trailer, the trailer experiences a consistent application of force from your tow vehicle. It should be the same with a tow strap. No slack in the strap, just steady, even tension. A true recovery strap is totally different. Recovery straps stretch. They’re elastic like rubberbands. They are supposed to see much higher forces than tow straps in order to yank vehicles that are stuck out of mud, off a rock, off a dune, or some other situation. A recovery strap is for freeing stuck vehicles. When you use a recovery strap, there will be slack in the strap, then it will be pulled taut and stretched, then it will be slack. 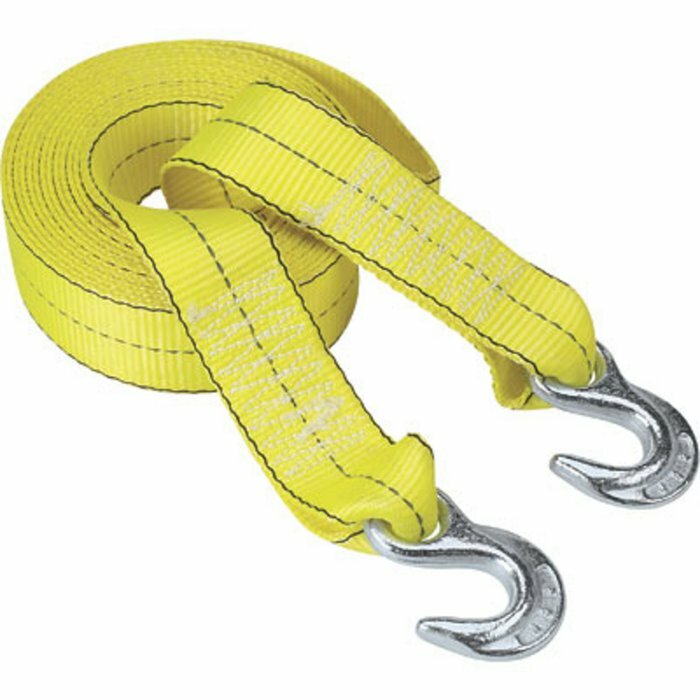 When tow straps are rated, they’re rated for the consistent force that should be applied. They don’t need to have a large safety factor built in because they are not designed to be yanked. Recovery straps have much higher safety factors and also are much less stressful for vehicle occupants in a recovery situation because they have give. Nylon is more expensive than polyester. Tow straps that you buy in big box stores or discount stores are usually cheap and imported. They are often made of polyester, which is is cheaper than the nylon that is used for a real recovery strap. Now polyester is perfect for use as a tree saver strap or as a winch extension strap. You don't want any stretch in either. But polyester is a terrible material for a recovery strap. Unfortunately, it's so much cheaper than nylon that it tends to be what you find when you need a strap. The hooks are made of steel, but you generally have no idea what the quality of that steel is. If everyone who bought one of these straps actually used it to its rated capacity, we think there would be a lot of failures. Most people misuse tow straps and that’s what causes them to fail. And frankly, it’s almost impossible not to misuse a tow strap. So let’s look at a scenario: a car is stuck in a ditch and you decide to help the driver. This is a perfect situation because you think it’s easy. Your rig is heavy, the car is light, you have a strap, and you get to show off your recovery skills. To pull the driver out of the ditch, will you use a slow, consistent application of force or will you end up jerking on the strap? When you start out, of course you’ll do it by the book, slow and steady. But the car won’t move and you’ll think, “Just a little more skinny pedal.” You let a little slack in the strap and give it some gas. This is where things start to go wrong. That’s because this situation is a recovery operation, not a tow operation. We all have good intentions to use our gear correctly when we start but our plans usually fall apart once we get going. You should know that the scenario above actually happened and that the driver of the towing vehicle was killed with his four year old girl sitting next to him. Somewhere in the recovery operation the hook loosened up and when he jerked on the strap it shot through his windshield and into his head. A tow strap with hooks is not a secure way to mount your strap. That’s because the hook does not positively lock. Even when a hook has a safety latch, the latch can be deformed and malfunction. While you’re repositioning your rig for a pull, the hook can slip to another location or simply be positioned in such a way that it slips off after it has a considerable amount of force on it. The hook then becomes a projectile that can kill or injure anyone in its path. This might sound ridiculous, but this is exactly how people are killed with intact hooks. In our scenario above, you should note that cars generally don’t have “recovery” points built in. They have “tow” points that are designed for the consistent, steady force of towing. If you attach your hook to the wrong (weak) part of the body, you could rip the hook right out of the mount. Again, this will send your hook rocketing through the air. The other way people are killed by tow straps with hooks is when the hook breaks. We mentioned above that tow straps are built with a certain safety factor built in for how it will be used. When you inevitably exceed the safety factor by jerking on the line (and we all do) the hook will break. Suddenly, you have a metal projectile flying through the air, either towards the cab of the pulling vehicle or the windshield of the stuck vehicle. Your recovery setup is only as strong as the weakest link. If your mount point is weak, it will break. If the hook is weak, it will break. If a strap is too small, it will break. All of these will result in dangerous flying projectiles. There are lots of stories on 4x4 forums of people that have had close close calls, been injured, or died due to tow straps with hooks, trailer balls shearing, strap attachment points breaking, shackles breaking, and other equipment failures. Here are some that made the news that only involve tow straps with hooks.